This stunning, light filled corner 2 bedroom, 2 bathroom apartment is part of Madison Green, a luxury full service condominium in the heart of the highly desirable Flatiron neighborhood. Huge, oversized windows allow for a truly spectacular close up view of beautiful Madison Square Park, as well as the awe-inspiring architecture of the iconic Flatiron Building, the Empire State Building and the New York Life Building. Apartment 5J is in great condition with new renovations currently in progress. The elongated living area with its lovely balcony and separate spacious dining area is perfect for entertaining family and friends. Imagine mornings on your private balcony with coffee and breakfast, or relaxing at the end of the day watching the magical sunset over the city. The windowed chef's kitchen is a delight with top of the line stainless steel appliances including Miele and Fisher and Paykel, and an abundance of storage space. The King-sized master bedroom has custom made closets and a generous, modern en-suite bathroom. The substantial second room is perfect for another bedroom, or to use as a home office. Madison Green offers residents fantastic building amenities that include a 24hr doorman/concierge, updated elevators, a live-in super, attached parking garage, fully equipped WiFi-enabled gym with locker room/sauna, a lovely courtyard, residents' lounge with full kitchen and WiFi, children's playroom, an ATM, dry cleaning/valet, bicycle room, storage lockers, and laundry on every floor. 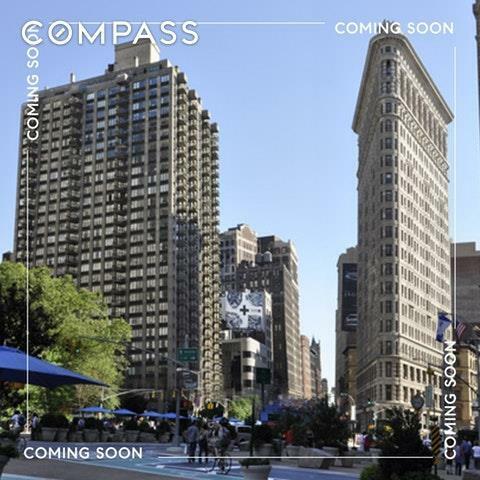 The central location at the intersection of Broadway and 22nd Street is steps from the fabulous Fifth Avenue shops, the Union Square Farmers Market, Eataly, Whole Foods, Trader Joe's, Fairway, and some of NYC's best restaurants including Eleven Madison Park and ABC Kitchen . Transportation is incredibly convenient with the R/W/6/F/M subway lines just outside the door and the crosstown bus down the block. Madison Green is a financially stable building with low common charges. Pets are welcome.